Venezia la romantica, Venezia la regale, Venezia la Serenissima. It doesn’t really matter how you decide to call it, Venice remains one of the most beautiful places in Italy. Unique in its structure and opulent in its art, Venice is one of the country’s most visited cities, a true bucket list location for many people all over the world. Among its many artistic and cultural landmarks, the Ponte dei Sospiri (the Bridge of Sighs) is one of the most popular among tourists, its name and its baroque, sinuous look conjuring immediately the idea of sights of love and passion. Pity that, as the majority of you probably know, the “sighs” of the bridge were probably not of that kind (more of it, of course, below). Yes, indeed: the Ponte dei Sospiri still has some secrets to disclose, in spite of its popularity. How many faces must it have seen, how many stories must it have heard, how many confessions and prayers… It’s time for its centennary stones to whisper, sospirare, to us its many, many secrets. The Ponte dei Sospiri was built in 1602 to connect Palazzo Ducale to the Prigioni Nuove, the new Venetian prisons. It was Marino Grimani, Doge of Venice at the time, who wanted it. 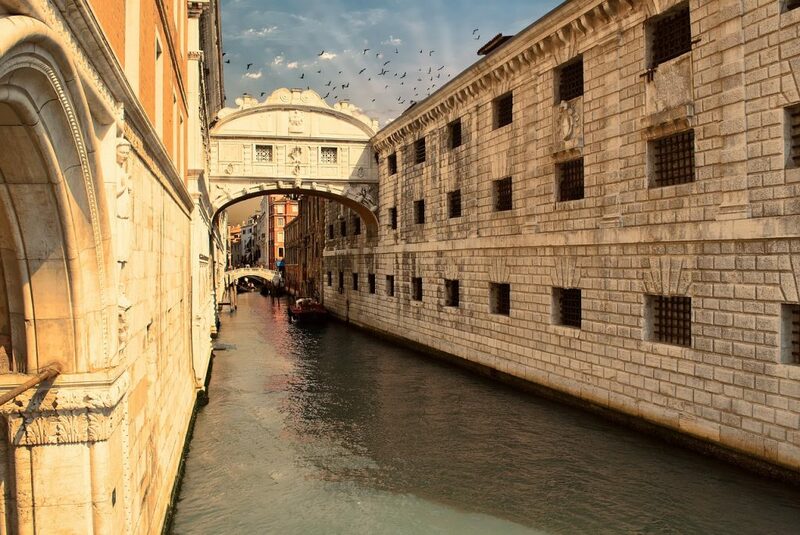 The new prisons had been constructed 20 years earlier by Antonio da Ponte, in a building opposing Palazzo Ducale. The old prisons, which dated back to the 11th century, were within the Palazzo, and it was there that the “Consiglio dei Dieci” (the Counsel of the Ten, one of the Venetian Republic’s main ruling bodies) would send prisoners. The bridge was built using white Istrian stone and has the peculiarity to be entirely covered and is formed by two, wall-separated corridors, leading to and forth the prison. Each of the corridors is connected to the stairs linking the infamous “Piombi” (the Leads), located in the area directly under the roof of Palazzo Ducale, and the “Pozzi” (the Wells) the worst of all the imprisonment areas in Venice. Both the “Piombi” and the “Pozzi” were located within Palazzo Ducale and were part of the prison complex the Prigioni Nuove came to flank at the end of the 16th century. In spite of its beauty, the Ponte dei Sospiri had a pretty somber task, that of pathing the way for prisoners towards Palazzo Ducale’s trial rooms, where their destiny was to be decided, and bringing them back to their cells. What we see as a quaint, romantic piece of architecture, suspended above the Rio di Palazzo, was in fact a very much effective prison structure. The Ponte dei Sospiri is considered one of the most romantic locations in Venice, even though a simple and brief excursus of its own history, just like the one you’ve just read, is very much sufficient to clarify there was nothing loving or romantic about its construction and initial use. Yet, today, you can bet a couple of Bellinis and a hefty serving of carpaccio at Harry’s Bar that every single couple on holiday in the city will either get a gondola ride to get a kiss under it, or make sure to take a selfie standing on the Ponte della Canonica or the Ponte della Paglia, the two bridges from which it can be admired. It’s also thanks to it the Ponte dei Sospiri became known as such. Its finely decorated windows are set along the very corridors prisoners would have walked to reach the Prigioni Nuove, making of the picture perfect slice of lagoon and sky visible from them the last taste of freedom for a potentially very long time. For this reason and obviously lead by an all-Romantic poetic afflatus, Lord Byron liked to think of these poor souls as sighing heavily in despair while crossing the bridge, aware of the harshness and pain to come. Sighs of pain, not love, gave to the bridge its name. Those cute couples may like to keep it in mind next time they share a kiss under the Ponte dei Sospiri. Ok, this curiosity is related more to the prisons than the Ponte dei Sospiri, but as the latter is basically part of the former, and because it’s a really cool story, I think it deserves a place here. We all know who Giacomo Casanova was: his name is guarantee of charm and unrivalled sexual escapades, as well as a series of more or less legal activities set on the backdrop of 18th century Venice. At dawn, on the 25th of July 1755, Casanova was arrested and brought to the Piombi. As it was customary at the time, Casanova was not informed neither of the reasons of his arrest, nor of the length of his detention. Sources allow us to know, today, that Casanova was considered a dangerous individual by the city’s government because of his libertine behavior, which was considered subversive and dangerous to the moral and social well being of the city. It was notoriously difficult to break out of the Piombi, but this didn’t demoralize Casanova one bit. Throughout the first 12 months of his detention, Giacomo had been thinking – and actively working – on his escape: he had managed to obtain a long iron nail and a piece of dark marble, which he used to create a hole in the ceiling of his cell, which was directly under the roof: it was through it that Casanova had planned to find his freedom. However, a prison warden named Lorenzo – a protagonist of Casanova’s tale, keep his name in mind – smelled the rat and had him transferred. Normal people like you and me, at this point, would have just given up, but not him. Known for his intelligence as much as he was for his sexual prowess, Casanova simply ideated another plan to escape. It was successful, but mind, fate gave him a big hand this time around. Here comes the story. In spite of being pretty awful, the Piombi were considered high-end prisons, occupied by criminals of lineage and social weight. For all your common villains there were the Pozzi, located in the basements of Palazzo Ducale, partly developping under the level of the canal and known for being the closest thing to Hell on this earth. This to make you understand that prisoners of the Piombi were allowed certain freedoms we wouldn’t necessarily associate with the status of 18th century inmates. They were , for instance, allowed to buy books and have them delivered to their cells, and also to exchange them with other prisoners. When Casanova expressed the desire to get very expensive volumes, he was made aware a Father Baldi, held in the cell just above his own, had them. Imagine Casanova’s surprise when, along with the first lent book, he received a message from Baldi himself, written on its first page. To make a long story short, the two entertained a correspondence through which they planned their escape; Casanova managed to pass to Baldi the nail he had used to make a hole in the ceiling of his old cell, hiding it into a large book he then had sent to his companion by Lorenzo the warden. With it, Baldi managed to make holes in both the floor and the ceiling of his own cell, allowing Casanova to reach the roof of Palazzo Ducale. From there, he then entered the palace, pretended to be a judge who had been mistakenly locked in and had the doors onto his own freedom opened by a guardian. With a gondola, he reached the close by Piazza San Marco and, legend says, he even stopped in a café for coffee before leaving Venice for Bolzano. Casanova was pretty proud of his escape from the Piombi, so much so he wrote it all down in Histoire de ma fuite des prisons de la République de Venise qu’on appelle les Plombs, published in Paris in 1787. Indeed there are. Such a beautiful structure, in such an iconic location was bound to rise the interest and envy of architects and people all over the globe. First of our list are certainly the Bridge of Sighs at Oxford University, which belongs to Hertford College and looks much more like Ponte di Rialto than Ponte dei Sospiri, and that at Cambridge University’s Saint John’s College. Another notorious Ponte dei Sospiri is in Lima’s Barranco District, Perù. The Puente de los Suspiros, which bears no resemblance at all with its Italian counterpart has been made famous by composer Chabuca Granda and is considered one of the most romantic places in the Peruvian capital. Last but not least is America’s own take on the Venetian architectural classic. Here, a modernized version of the bridge serves to connect two buildings of the Metropolitan Life Insurance Company Tower Complex. As a matter of fact, the tower itself brings an uncanny resemblance with the Basilica di San Marco’s belfry. 4. Sighs of love… because of a movie? We’ve said how the real “sighs” of the Ponte dei Sospiri had little to do with those of lovers. Yet, for some reason this prison bridge is known more as a romantic location – which it has never been – than a restrictive location – which it actually was. This may depend by the popularity of a 1970s movie, “A Little Romance”, based on a novel by Patrick Cauvin entitled “E=mc2 Mon Amour”. The film, starring Laurence Olivier and Diane Lane, won the Oscar for best OST and features a kiss while on a gondola, under the Ponte dei Sospiri, as the dream of its young protagonists. …And truth is the legendary side of the Ponte dei Sospiri, its cinematic ties with love and lovers, will likely remain more popular among tourists than its much more sombre history. Whichever way you decide to look at it, this white, elegant bridge remains a symbol of Venice and a monument to the Serenissima millenary history.